Vin Scully is a national treasure, and after the 2016 season, we're going to have to find a way to enjoy baseball without him. He's been the voice of the Dodgers for nearly seven decades, he's been inducted into every hall of fame known to man (as well as a few that have yet to be invented), and he's won more awards than would probably fit in your house. While I was typing that sentence, he won eight more awards. He's that good. Certain phrases will always be married to Vin's voice. "In a year that has been so improbable, the impossible has happened!" Anyway, Vin is retiring after this season, so the Internet has finally started to pay some attention to one of the best parts of a Vin Scully broadcast: the stories he tells about the players. It's a sight to behold. 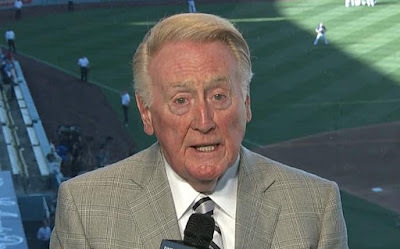 I'm convinced that Vin was actually granted omniscience by the baseball gods many decades ago, because there's just no other way he could know some of the things he knows. This led humorist John Moe to whip up a fake Vin Scully moment, which was made all the funnier by the fact that some people fell for it. Unfortunately, the Tigers don't play the Dodgers in 2016, so these are the last of the Tigers-related Vin Scully stories. They're pretty amazing. There's a connection with Miguel Cabrera and Adrian Gonzalez. Adrian Gonzalez, who was a Marlins farm hand, he was in Cabrera's wedding. He served as the couples' marriage sponsor in the Catholic Church. His mom's a Medicaid case manager for the state of Arizona. His father had the nickname, certainly in the family, of "the prison warden" -- which he actually was -- he had the job for the department of corrections in Tuscon State Prison. And any time Kinsler would get in trouble, and he would get in a lot of trouble as a little kid, and the thing that really ticked his dad off, his father would tell him to do something and he would roll his eyes -- there goes [Rajai] Davis, not even a chance to throw him out. Presumably, Ian never told his father to do his f***ing job. He has three brothers, so they were able to play all the time, one brother would pitch, one would bat, one would play the outfield. And the way they did it, they had their own game -- he fouls it away -- any ball hit to right field was an out. So that meant, when they were playing their game, they tinkered a little bit as to the different ways to hit the ball to left field, and that included batting right handed. And because of that, Victor Martinez is a switch-hitting big leaguer. Given the way teams shift on Victor today, he's still basically playing by that "any ball hit to right field is an out" rule. Max Scherzer, like many ballplayers, has some superstitions, and he told about one superstition that really shook him up last year -- he told it when he was getting the Cy Young Award. Ramirez waiting on the 2-1 pitch ... and the pitch fouled away ... Scherzer was saying things were going pretty well, and then he got into the dressing room, and he was looking for his lucky belt. He wore the belt during his early season winning streak, and before a game in Cleveland, he thought it was missing, and I mean to tell you, he panicked. "I'm looking for my belt! I can't find my belt! Where's my lucky belt? Well, the bat boy came over and said, 'Where's your lucky belt?' So he grabs me one of the other belts and says, 'You have a belt right here,' and I'm saying, 'No, that's not my lucky belt!'" Here's the 2-2 pitch coming up to Hanley, and he'll throw over to first ... well sure enough, they tore through the locker, and there was the lucky belt. He found it, put it on, went out, and beat Cleveland. And before the beginning of the year, the now-retired Tim McCarver said to Max Scherzer, "You're going to win the Cy Young Award this year," and with the lucky belt, he sure did. [As Hunter limps around the field, having just injured his knee] Well, if you come from where Torii comes from, no electricity in the neighborhood, gangs over the corners, drugs the currency ... in fact at one time, Torii Hunter talks about, he slept on a towel because the springs in his bed popped through the mattress, and there were days he and his brothers knocked on the neighbors' doors, asking for food, so it's going to take a serious injury to take him out of the game. He had a very tough childhood growing up. His mom was an elementary school teacher, and his father was a railroad worker -- his name was Theotis. HOWEVER. Theotis became a crack addict. In fact, his father disappeared for quite a while -- Torii takes ball one -- and he disappeared with Torii's favorite jacket. And then, one day, Torii got up in the morning and his dad was asleep on the couch, and there was the jacket on the back of a chair. So he put the jacket on, he was so thrilled, and he went to school. And he wanted to answer a question, he raised his right hand, shaking it, and falling out of the jacket was -- what do you call it? -- a crack pipe? I guess that's what you call it. That's the first time he realized his father -- well, you get the idea. Yeah, Vin, we get the idea. We're really, really going to miss you.